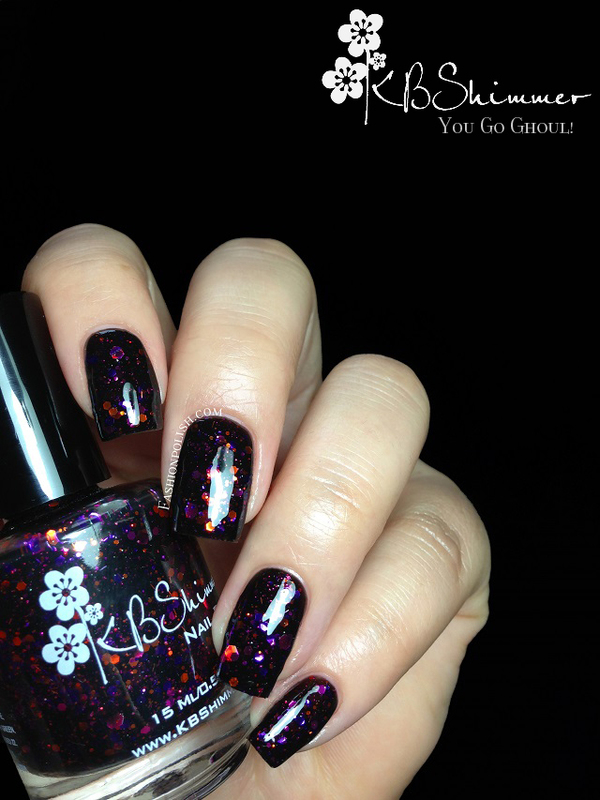 Fashion Polish: KBShimmer Fall collection Review! 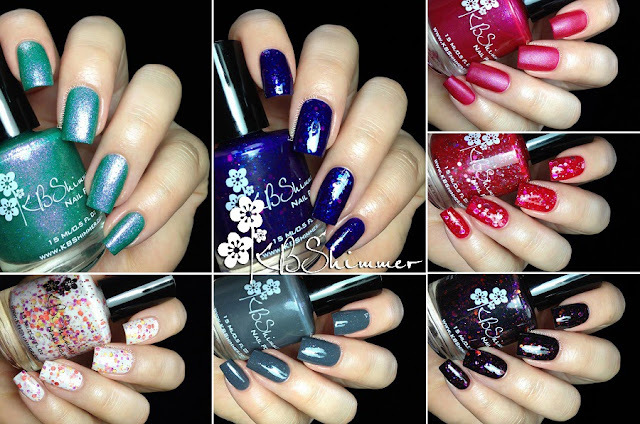 I'm super excited to show you the lastest KBShimmer collection with you today! With four glitters and three shimmers, there's something for everyone. Let's just give them a closer look, shall we? 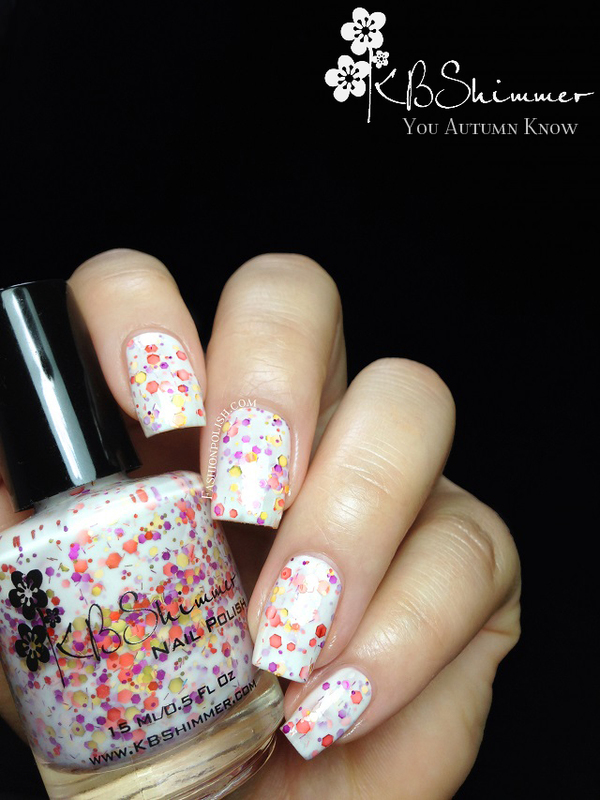 You Autumn Know : white crelly loaded with gold, orange and fuchsia glitters in different shapes and sizes. The glitter blend looks beautiful in the white base, perfect for Fall! Formula was flawless, even and easy to apply and didn't require any fishing. I used 2 coats plus topcoat below. 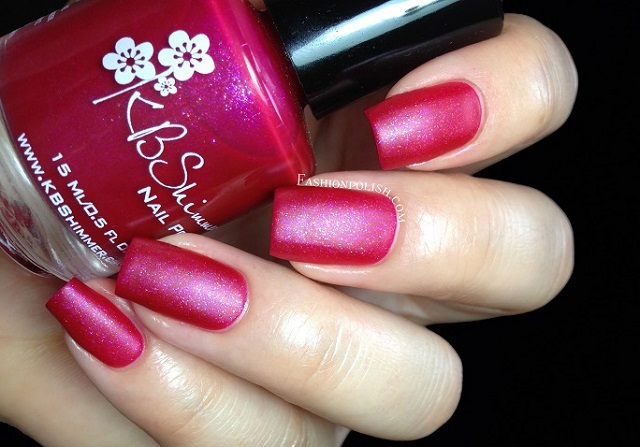 Every Nook & Cranberry : deep cranberry with a multicolored shimmer that dries to a satin finish. I absolutely love it without topcoat, it looks so unique on its own! Nice and easy application with good drying time and a 2 coat coverage. Swatches with and without topcoat. 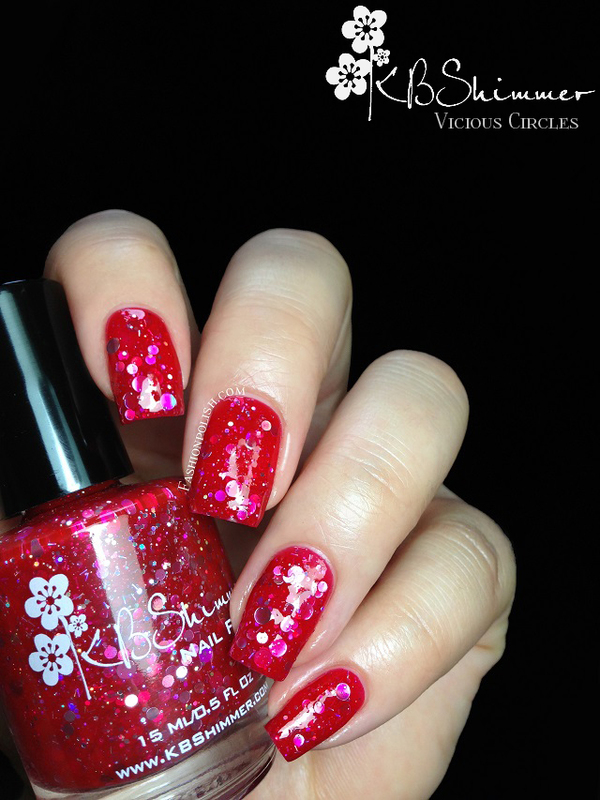 Vicious Circles : bright red jelly packed with different shapes and sizes of silver holographic glitters. 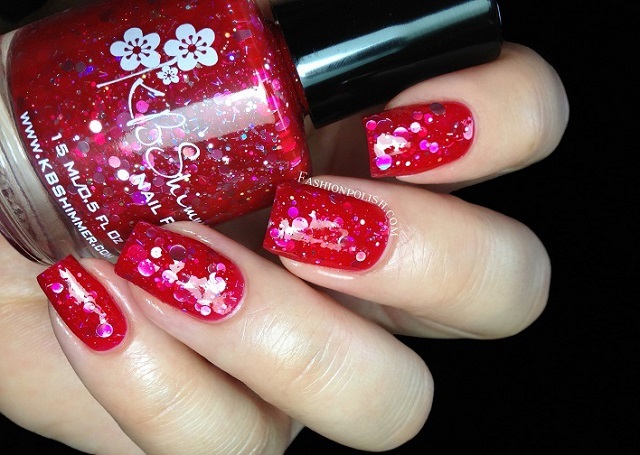 Red+glitters+dots? The perfect combo if you ask me! Consistency was a little thick due to the crazy amount of glitters so I'd recommend layering it over your favorite red jelly or sticking to a 2 coats coverage like I did here. Turbulence : slate grey satin filled with pink and blue shimmers as well as flat silver flakes. Another beautiful and unique color, not what you'd typically expect from an indie brand but simply stunning nonetheless! Formula was really nice, very similar to Every Nook & Cranberry. Two coats with and without topcoat below. Teal Another Tail : dusty teal green base packed with a heavy pink glass flecked shimmer. Just breathtaking! I don't have anything like it in my collection. Easy application and a 2 coats coverage, swatches without topcoat here. Excuse Me, I Blurped : dark blurple jelly mixed with turquoise, blue, purple, fuchsia and copper glitters. This one's a huge surprise for me, I have no idea how Christy Rose did it but she managed to create the most perfect blurple glitter sandwich with just 2 coats of Excuse Me, I Blurped! So much depth! You Go Ghoul! : Halloween black jelly with pink, purple and orange glitters, hexes and micro bars. 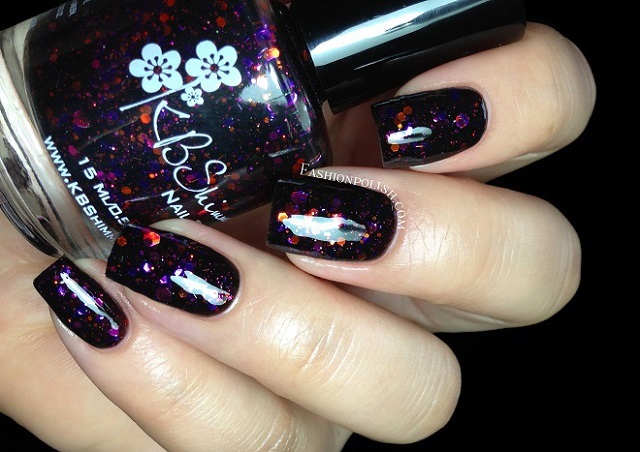 If you know anything about me, you know that I love blacks and black based glitters and this one rocks! Application was just as easy as the rest of the collection, I used 2 coats plus topcoat, thin on the first and medium on the second. Once again, I can only recommend KBShimmer! Application and glitter pay-off proved to be perfect on the entire collection and obviously they are all to die for. I honestly could't pick a favorite, it'd be a tight between Teal Another Tail, Excuse Me, I Blurped and You Go Ghoul! but I don't think I'd be happy without Vicious Circles, Every Nook & Cranberry and Turbulence either... Ok the whole collection is a win! What do you think about this collection? Are you in the mood for Fall colors yet? KBShimmer products can be found at KBShimmer.com. For sales outside of the US visit HarlowandCo.org.